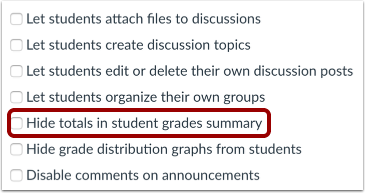 If your course is using Multiple Grading Periods, this setting restricts students from viewing grades in any grading period, even if the Display Totals for All Grading Periods feature option is enabled. Select the Hide totals in student grades summary option. 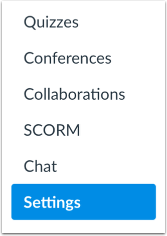 Previous Topic:How do I show recent announcements in the Course Home Page? Next Topic:How do I hide grade distribution scoring details from students? Table of Contents > Settings > How do I hide totals in my students' grade summaries?